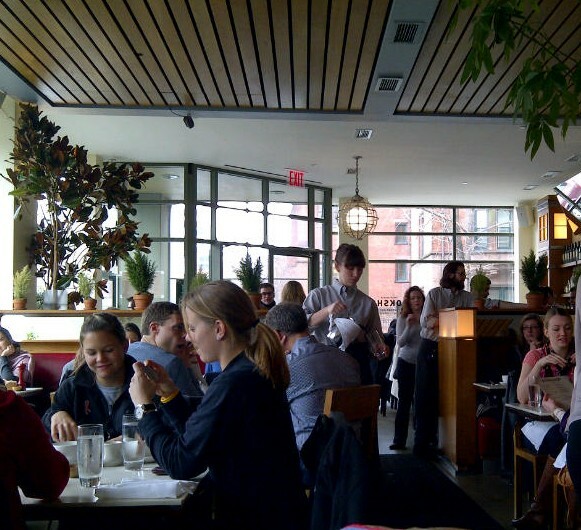 Cookshop is warm and inviting, the perfect antidote to a rainy Saturday morning in Manhattan. The restaurant is on the corner and is flooded with natural light, the walls are covered in wide yellow tiles and potted plants, the ceiling has strips of honey colored wood, and there are brightly colored paintings of vegetables on the walls. I knew I was going to like the restaurant when we sat down and saw that each table has a small wooden bowl with sea salt and a red painted wooden pepper mill. I’ve noticed lately that the more “foodie” a restaurant is, the less likely it is to put salt and pepper on the table – this strikes me as a presumptuous assertion that every dish arrives at the table perfectly seasoned, and if a customer needs additional seasoning, well, their palette is clearly off kilter. As you can tell, Cookshop wins major bonus points in my book for this attention to detail. But I digress. The menu is as inviting as the atmosphere, with creative takes on traditional brunch dishes and a full bar with breakfasty concoctions. I ordered the fried egg sandwich with house made sausage on a homemade sesame bun. 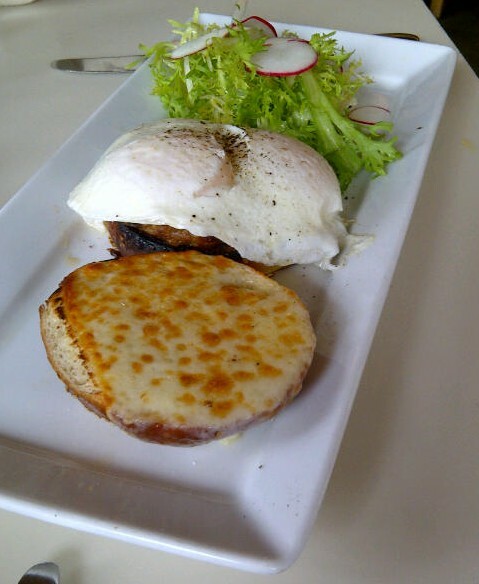 The dish came out with the cheese perfectly toasted onto the top of the bun and a fresh small salad with radish slices on the side. Each individual ingredient was delicious – fresh, high quality, and full of flavor. However, I have to admit that I was a little bit disappointed by the dish as a whole – because of the way it was prepared and presented, it was nearly impossible to eat and have a bite with each of the flavors combined, so it felt like I was missing out on the essence of the dish. My sister got the smoked salmon scramble on a biscuit, which was fantastic – the biscuit was buttery and light and the scramble had a perfect ratio of stuff (salmon, chives, crème fraiche, etc.) to egg. 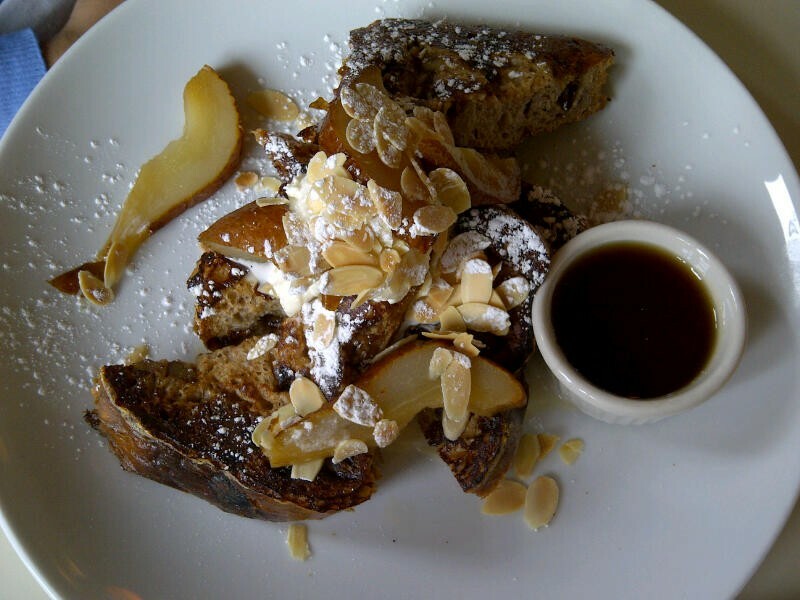 My friend ordered a very decadent french toast dish – while it was a delicious mix of vanilla, apple and cream, one bite was all I could handle. By the time we left the restaurant, the weather outside had started to match the sunnyness inside. This entry was posted in Brunch, Chelsea, New American, New York and tagged Brunch, Chelsea, New American, New York. Bookmark the permalink.